Way back in 1958, Anthony Napolitano was polishing a customer’s shoes in a Bennington cobbler shop when he heard the news that the most beautiful woman in the world was arriving in New York Harbor. Without hesitation, young Tony put on his best suit of clothes and got his brother to drive him to the city to make sure he was there when she walked down the gangway. His mind was full of dreams of holding her in his arms and never letting go. To make a long story short, Rosa was the last person off the boat. To make a short story long, one has to talk about family, Italy, immigration, the Great Depression, World War II, honest work and good fortune. In the early 1900’s, Tony’s parents emigrated from Italy to work on America’s railroads. But in the 20’s, when the work dried up, they left their three American-born children with relatives in upstate New York and returned to the little town of Moiano, southeast of Naples. There, Mrs. Napolitano gave birth to another son; Anthony. The year was 1927. Tony continues, “When I was just 18, right after The War, I graduated from the Police Force Academy of Torino. I tell you, it was a dangerous time to wear a uniform.” He explains that, stinging from years of fighting and a humiliating defeat, Italians were both hungry and angry. Crime was rampant, and both ordinary people and the syndicate families took their anger out on policemen. Many were murdered. In 1953 synchronicity struck. Tony’s contract with the police was due for renewal and Domenico’s partner in King’s Shoe Repair decided to leave the business. It being time to have his own shop, Domenico bought a building around the corner on North Street. It had two apartments above and he wrote a letter to Tony asking him to come to America. At first Tony shined shoes all day long. 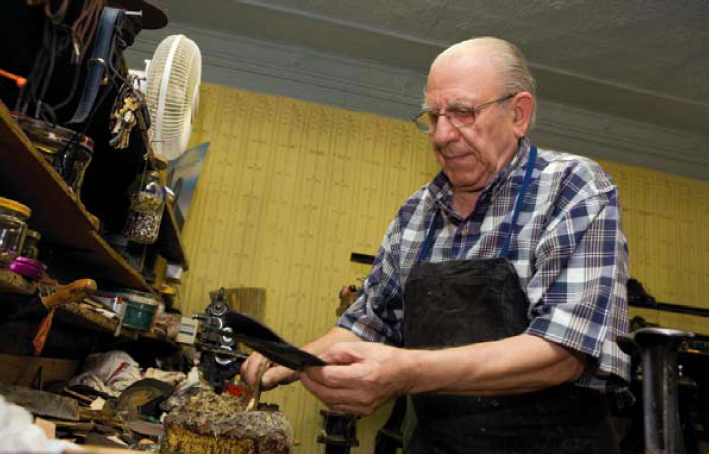 “Everybody had their shoes shined in those days.” He waves a hand toward the shoeshine bench, which still dominates one wall of the shop on North Street. It’s big enough to seat three customers at once. “We were open on Sundays. It was a big day, because people came in before going to church.” After three months, Domenico started Tony working with the machinery, and he loved it. Two years passed. When Tony knew he would stay, he sent for Rosa, but with all the paperwork it took another eighteen months for her to arrive.” Rosa, a sweet woman with a warm smile, joins us. “I didn’t know a word of English and I hadn’t seen him for almost four years. I was nervous. That’s why I took so long getting off the boat.” That, and the fact that she had to carry all the baggage for two people. You see, she brought her daughter Maria, almost three years old, to meet her father for the first time. “The policeman on the dock told me, ‘Sir you can’t go through there,” says Tony about seeing Rosa on the gangplank. “Well, I pushed right by him and ran over. And we’ve been together ever since. Fifty-one years. 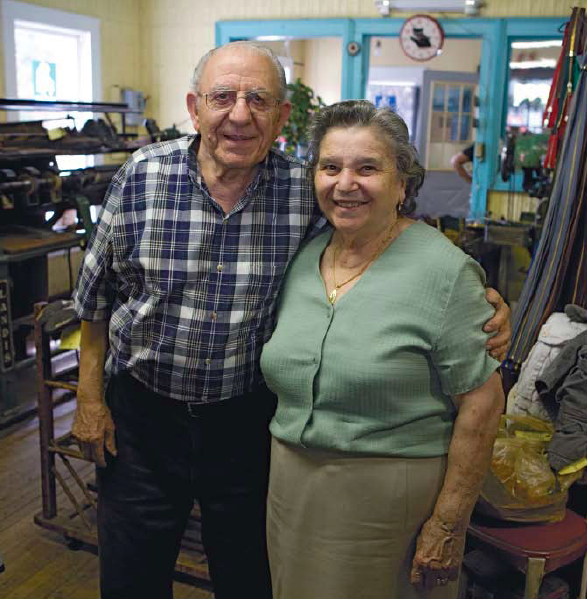 We moved right upstairs into the apartment next to Domenico.” The brothers worked together for ten more years, until 1968, when Tony bought the business and the building. He and Rosa remodeled the upstairs into one apartment that has served as their home ever since. 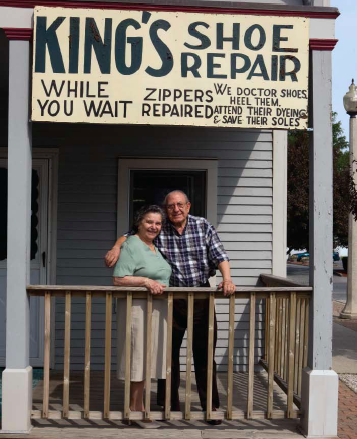 Downstairs, however, King’s Shoe Repair looks the same as it did in the fifties; old wood floors in the open area where you walk in, the shoeshine bench where conversations of joy, gossip and politics echo from the past. The shelves for new shoes anchor the far wall and, of course, there is a special green chair where patrons sit to have their feet sized. A high service counter cuts the room in half and, behind it, a modern cash register (from the sixties) shares space with a workbench worn from countless repair jobs. Its surface is buried in tools of every sort, thread, pieces of leather, an anvil and a vise. Behind that, the massive, black machinery from 1936 still hums like a Cadillac. In the adjoining room are several stitching machines. The tasks lie there as they did at the end of the day on Saturday ready for a man to pick up on Monday. Rosa is comfortable in the shop, but she says ‘no’ when asked if she repairs shoes, too. “I do other things. I do tailoring and special projects. On the machines out back.” Her favorite is an old Singer treadle sewing machine, much older than either her or Tony.